The Aprilaire 401 2-Pack Filters Replacement for Model 2400 Air Cleaner (2 Pack) is an ideal replacement for your filter, as it’s an exact replacement to the standard filter. This MERV 10 rated filter can also be retroactively fitted into your older Space-Guard Air Cleaners by simply applying the 1413 Upgrade Unit. 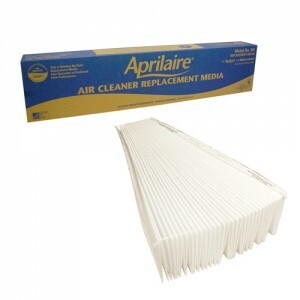 Take advantage of all of the cleaning effects of Aprilaire’s new media filters on any of your older air cleaners and order the Aprilaire 401 Filter Space-Guard Replacement Filter Media for Model 2400 Air Cleaners today! Dimensions: 16" x 27" x 6"
Product was good quality and arrived on time. Would reorder again. I have ordered from this company on three different occasions. Prices have been good. I have no complaints and will continue to do business here.